Photo courtesy of Richard Audette. 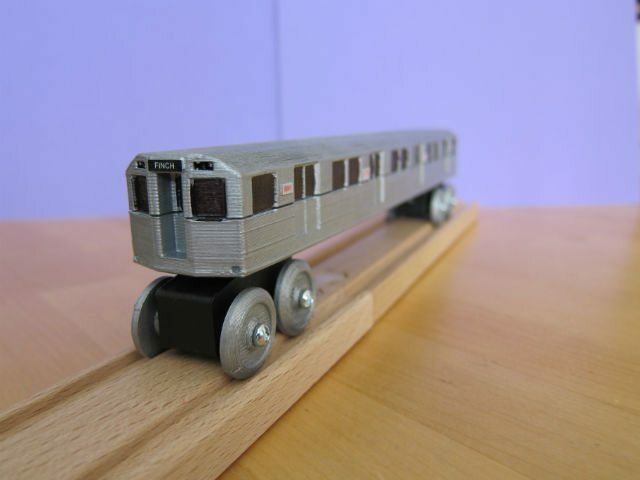 If you are (a) a lover of small, beautiful things, (b) a 3D-printing enthusiast, or (c) someone who just wants to look at an H6 subway car on a regular basis, you will be happy to know that someone has designed a small, 3D-printable H6 subway car. Creator Richard Audette printed his at the Reference Library, and he’s made the specs available online. The subway car will work with Brio-compatible wooden train tracks, so if you’re not content simply staring at it, you can always watch it ride the rails. Mathieu Chantelois has served on the boards of Montreal’s Divers/Cité and the 519 Church Street Community Centre and worked in journalism. (He also spent some time living in a loft in downtown Toronto with seven other people while being filmed for television.) He’s now poised to take on a new challenge: today, he became the new executive director of Pride Toronto, replacing outgoing ED Kevin Beaulieu. Do you have strong feelings about the Scarborough subway extension? Or do you perhaps simply want to listen to other people discuss their strong feelings about the Scarborough subway extension? If so, you should head out to one of the upcoming open houses dedicated to the topic: on January 31 and February 2, you’re invited to have your say about the project’s terms of reference, public consultation plan, and evaluation criteria.